Dancing Leaf Design: Dancing Leaf Design's Jewellery is now available at the Vancouver Art Gallery Gift Shop! Dancing Leaf Design's Jewellery is now available at the Vancouver Art Gallery Gift Shop! I'm visiting family in the US right now (Seattle) and took a trip a week ago up to Vancouver. 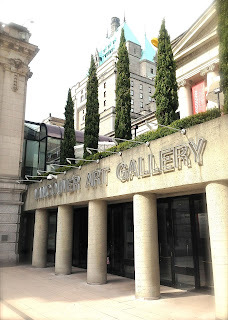 While I was to meet friends I stopped by the Vancouver Art gallery and saw a pari of earring you designed that I could not live without. They are just beautiful. We are heading home (France) soon and I'll be wearing your earrings on the streets of Versailles where I live. If anyone asks me where I got them, I will be delighted to send them straight to you.